If I were to ask you how many times the average person chews a bite of food, what do you think the answer would be? If you guessed 3, than you would be absolutely correct. The average person only chews about 3 times before swallowing a bite of food. Now, really think about that. Your body has to work extra hard to break down that food that you are basically swallowing whole. 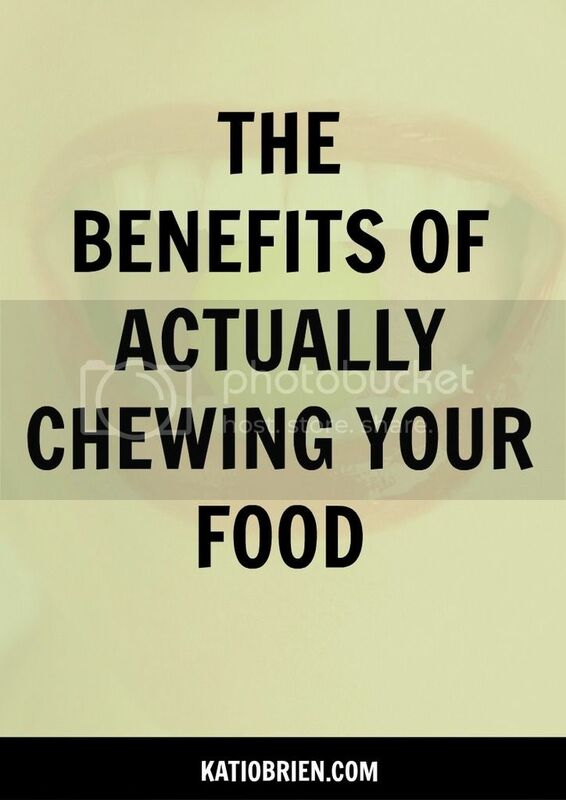 You may not have realized, but chewing plays a vital role in digestion. When you chew your food, the saliva has important enzymes that also help break down food, making it easier to digest and assimilate which allows for more of the food to be used by the body instead of being stored as fat. Since proper digestion is extremely important to your overall health and wellness, it is crucial that you start to chew your food more. 1. Practice Chewing - This may sound silly, but just hear me out. Take a bit of something and without thinking to much of it count how many times you chew it. Then with the next bite try to chew it a few more times. Try to focus on chewing each bite as long as possible. 2. Put Your Fork Down - In between each bite of food, put your fork down. This will help you to chew more and stop shoveling in the food, bite after bite. 3. Be present - Try not to do anything else while you eat. The more present you are with the food you are eating the more aware you will be with how much you are chewing. 4. Breathe - Don't forget to take breaths frequently between bites. People sometimes get carried away when eating and forget to actually take some deep breaths. 5. Slow down - Really try to slow down the eating process. It should take you at least 20 minutes to eat a meal. Most people consume a meal in under 30 minutes which is extremely detrimental to your digestion. By slowing down your chewing and overall eating time, you will improve digestion and most likely eat less and feel more satisfied. I'm sure you've never really thought twice about how many chews you are taking with each bite, but hopefully this information will help you to be more aware going forward. If something as simple as chewing your food more could impact your health significantly, wouldn't you just do it? Give it a shot and I'd love to hear if you notice any difference or benefits from ACTUALLY chewing your food.